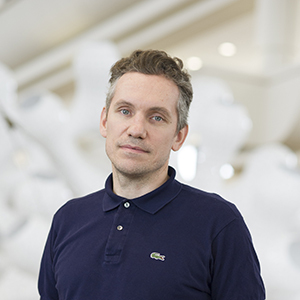 The Stripes Effect from MARC FORNES / THEVERYMANY on Vimeo. “Minima | Maxima stands at a crossroad of extremes: an ultra-thin shell of just 6mm rises to a height of 43 feet by way of its sprawling, double-curved surfaces. 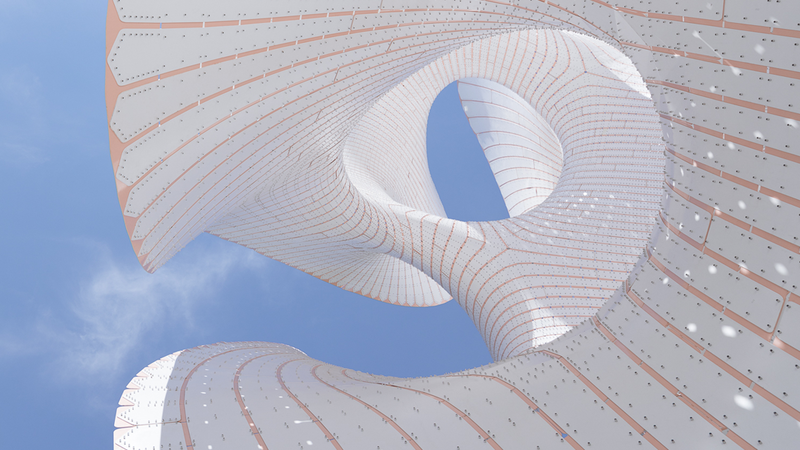 In this whimsical yet durable universe created by MARC FORNES / THEVERYMANY, curves win out over angles. Branches, splits and recombinations make columns and beams irrelevant. 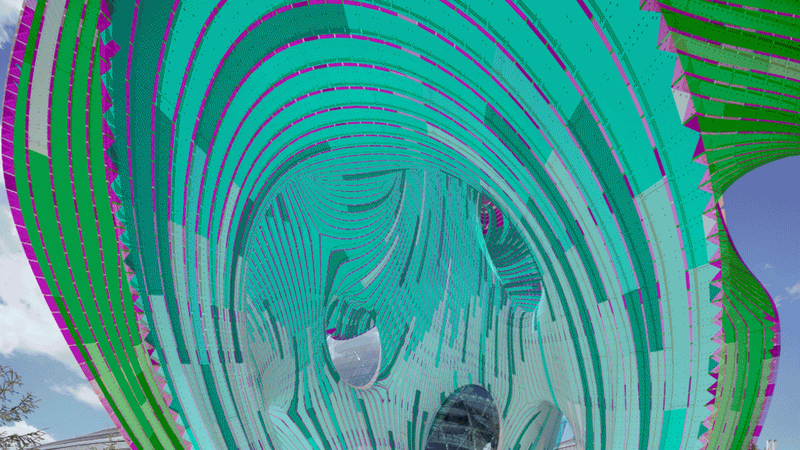 A “networked’” surface rolls in, on and around itself, transforming into a space that upends preconceived notions of enclosure, threshold and limit, while also providing its own support. Towards the base of the Minima | Maxima, its rolling surfaces begin to softly corrugate, its zig-zag angles gently tuck into a full pleat as they meet the ground platform. The visual transition — from pleated base to smooth and doubly-curved, continuous surface — is subtle, yet its structural effect is significant, allowing it to rise to impressive heights. It bends in all directions, but still manages to stand upright on its own. Minima | Maxima was commissioned for World Expo 2017, an event with a history of architectural and engineering innovations. 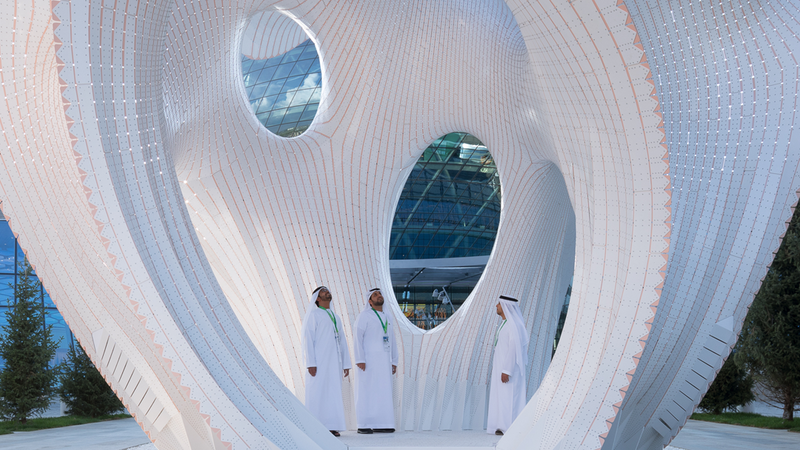 A response to the theme ‘Future Energies, the pavilion makes the most out of the least material. 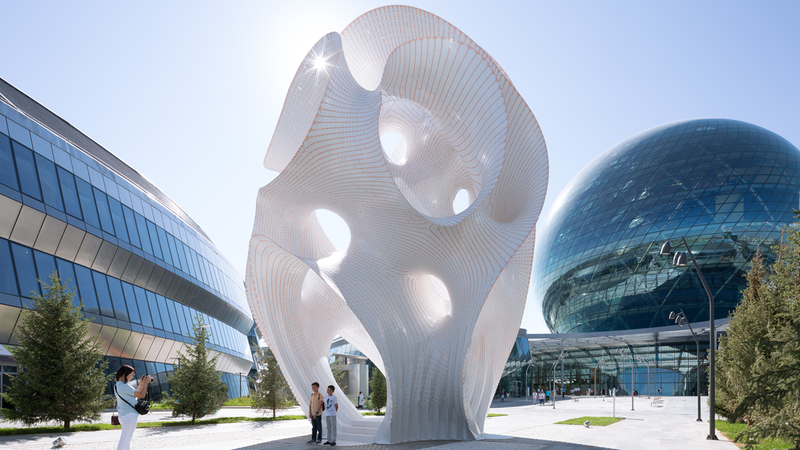 Is situated prominently on the Expo grounds in Astana, Kazakhstan, where it will continue to live as a permanent structure. There it remains a destination of interest for visitors to the rapidly developing city, an environment that incites curiosity from afar and opportunities for play, discovery and quiet contemplation inside. Three layers of flat, aluminum stripes — white and white sandwiching pink — are cross-laminated, supporting one another as they assume curvature and gain height. One layer never exists independently, but contributes to and benefits from the unified whole. The innovation lies in this multi-plication, where aluminum, an isotropic or non-directional structural material takes on anisotropic (directional) structural properties in its patterned, composite form. The system warrants comparison to fiber technology — such as carbon or glass fiber — yet is unique in that unlike fibers, each individual component does not need to be in tension. The assembly requires no mold or temporary scaffolding, and because it is mechanically bonded, the system allows for recomposition and correction during construction. I admire this entry for its structural beauty that encompasses both polarities of "minimum" which is a traditional aesthetic of design and "maximum" which is a new aesthetic essence seen in digital fabrication recently. I absolutely love the signature work of THEVERYMANY as it's instantly recognizable and iconic. It is a kind of beautiful mathematical poetry in a brilliant complicated form that operates at full-scale successfully. The structure seems to almost float effortlessly despite its enormous size. It is an incredible use of fabrication equipment, lightweight materials, and especially the detailed assembly of a super large meta-object. 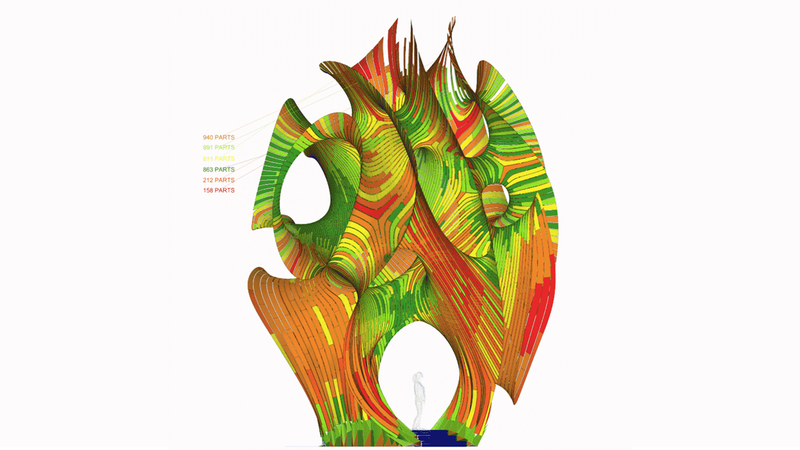 It's both a fabulous extra-spatial model and an exhilarating architecture at the same time. Bravo! Beyond the form produced, it is the principle of construction that challenged me. The developed concept opens up the possibility of building complex shapes on an urban scale. Dynamic and ambitious expression of the potential of digital fabrication in both material, technical and structural terms. The material is modern, beautiful and provocatory. I believe Minima|Maxima is interesting in that it opened YouFab to possibilities in larger organizations, where Fab has been used as a base for personal success.